The Sanctuaries of St. Peter Chanel, Villa Maria and St. Charles Borromeo, Ryde, are similar in having a rounded section behind the altars. Villa Maria and St. Charles Sanctuaries have hemispherical roofs while St. Peter’s has a hammer beam roof. The construction of Villa Maria church began with the laying of the foundation stone by the Archbishop of Sydney, John Bede Polding on 15th September, 1867. The first wedding was held in 1868 prior to the roof being completed. The church was opened in 1871, and a marble altar was installed in 1890. It was extended by two bays in 1904 as a memorial to Father Muraire who had died in 1903 after thirty nine years in the parish. James Park of Gladesville carried out the work involving the two extra bays and dismantling and re-erecting the front façade with a new bell tower. The twenty eight stained glass windows of Villa Maria are quite magnificent and overall are valued at over $500,000. The two outstanding windows in the transepts are each of three lights, the Crucifixion on one side and the Holy Family on the other. They were manufactured by Pagnon Deschelettes of Lyon, France. Other window manufacturers are G. Dufêtre of Lyon and John Ashwin and Co. of Sydney. In 1851, before Ryde became a separate parish, a recently ordained Father John Ignatius McClennan O.S.B. acted as pastor and travelled from the presbytery at Parramatta to areas as far away as Pymble and Tarban Creek. Unfortunately, he died on 4th November, a few days before the official opening of St. Charles Borromeo in 1857. On 1st April 1856, Dr. John Bede Polding O.S.B. gave Father Jean Louis Rocher S.M. responsibility for the parish of St. Charles Borromeo and he took over the incomplete church in August 1857. This was at the time when a fierce storm wrecked the ship Dunbar on South Head on the night of 20th August, 1857. The same storm blew slate tiles from the roof of the church and delayed its completion. The first Mass was said on 8thNovember, 1857, by Archdeacon McEnroe substituting for Archbishop Polding. This early Gothic style church was built, facing west, to the plans of A.W. Pugin (1812 – 1852) a famous English architect. The builder was John Crotty and took from May 1854 to November 1857 to complete at the cost of a little over £1500. The 4 ½ acre block of land was donated by Daniel McMahon in 1849 and the church was built on the corner of Great North Road (now Victoria Road) and Charles Street. Bishop Charles Henry Davis O.S.B. laid the foundation stone after Mass on 4th January 1852. 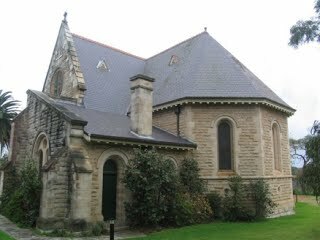 He was instrumental in obtaining a government grant of £1500 towards the building of the church. At this time the church was called St.Joseph’s. After Bishop Davis’s death on 17thMay, 1854, the name was changed to St. Charles Borromeo, the patron saint of Bishop Davis. 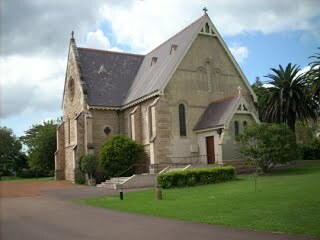 The Marist Fathers administered the Ryde parish until 1888. However, between 1899 and 1906, the Marists returned to care for the parish of St. Charles Borromeo. Originally given to the Society of Mary by Archbishop Polding in 1856, and covering an area from Parramatta to Balmain, the parish had been divided in 1889, the Marists receiving the Hunter’s Hill end, and the last of the Sydney Benedictines, Archpriest Samuel Sheehy, becoming Parish Priest of Ryde. Sheehy fell out of a carriage midway through 1899, and never regained his health. He lived in the presbytery until 1906, when Cardinal Moran relieved him of his charge. The Marists cared for Sheehy’s parish throughout this period, Francis Huault working there initially, and in later years, his brother Julien, who had come to Villa Maria in 1903 from Fiji. Poor health and an erratic temperament had rendered Julien unsuitable for the Mission. In assisting Sheehy, the Marists were repaying a long-standing debt, for he was, according to Fr. Aubry S.M., “one who has always shown himself our best friend since we came to Sydney, and whom we needed to thank several times at St. Patrick’s when everyone, except he, was pushing the Archbishop to send us away”. Fr. Sheehy died in 1910. but in 1907 he would render the Marists one further and significant good turn. As an adviser to Cardinal Moran, he was able to convince the Cardinal that in excommunicating Father Peter Piquet, an assistant priest at St. Patrick’s, he had made an error in Canon Law and therefore the excommunication was invalid. The Cardinal immediately renounced the excommunication and Fr. Piquet returned to his normal duties. St. Charles proved to be too small and in 1934 it was rebuilt and enlarged using the stone from the original church for the external walls. The Parish Priest insisted that any further material required should be stone. The internal walls are of cream face brick in English bond. The architects were Fowell and Mc Connell, and the builder was R. M. Bowcock of Ashfield at a cost under £10,000. The church now faced north, but the western entrance and bell tower were retained. Plans showing the layout of both churches are available with the seating raised from 250 to 600. The stone framework of the old eastern window was designed into the new Sanctuary on the southern side, with a new fine stained glass window. It depicts incidents from the life of St. Charles Borromeo and was made by John Ashwin & Son, from sketches of the architects. The Parish Priest from 1906 to 1948 was Father E. Gell, who, with his own personal money, generously supported Our Lady’s Nurses of the Poor (Brown Nurses) at Coogee. He is buried in the Priest’s Circle at Field of Mars Cemetery. Buried in St. Charles Borromeo Graveyard was Saint Mary McKillop’s mother, Flora (now re-interred in Macquarie Park Cemetery). St. Peter Chanel, first Marist martyr and first martyr of Oceania, was born in Cuet, France on 12th July 1803. He joined the Marist Society at the age of 28. In 1836 he was sent as a missionary to the island of Futuna, a very small island (15 kms. X 10 kms.) in the Pacific Ocean, east of New Caledonia, between Samoa and Fiji. The journey took 11 months arriving in November 1837. In his naivety, he offered advice which was in complete contradiction of the island culture. This caused the chief to order his death and in 1841, in his 38th year, he was clubbed to death by the chief’s son. His life was not in vain. Within three years of his death, the whole of Futuna, a population of almost 900, was Catholic, the natives having requested another missionary be sent. His body was brought back to Hunter’s Hill, a suburb of Sydney, but eventually was returned to France for burial. In 1977, his body was taken back to Futuna and permanently buried there. He was canonised in 1954. The church in Hunter’s Hill was the first in the world to be named after the saint, having been called the Church of Blessed Peter Chanel up until 1954. The land for the church was purchased by Father Claude Joly, S.M. in August 1890, from W. Cope and G.S. Arthur. It had been acquired previously from C.E. Jeanneret in 1882. It is situated at 5 Crescent Street with a frontage to Futuna Street. The property of just under 1 ½ acres cost 17,500 French Francs (£700) which was well under market price. £ Sterling was used in Australia until 1909. The Gothic style church was built in two stages. The first stage of the programme was to build the Sanctuary and Sacristy at a cost of about £1000, the foundation stone being laid on 26th October 1890. This stone cannot be located. In the sacristy was a fireplace for the comfort of the priest who came by horse the night before Mass was to be celebrated. The walls of this first stage are plastered on the inside and a temporary wall on the western side and roof over this section were erected. This small area of Sanctuary and Sacristy accommodated up to 150 people for Mass. They possibly came by boat from Lane Cove, Longueville, Northwood and Greenwich to Garrick’s Wharf (photos available) at the bottom of Crescent Street, as well as from Hunter’s Hill and Woolwich. It was opened on 11th December, 1892. The architects were Tappin, R. J. Dennehy and Smart. Their proposal was to build the church as it now exists except that the nave would be 120 ft. long. The two transepts were to be retained at 15 ft. wide by 25 ft. long. The Parish Priest, Father Zephirin Muraire, S.M. decided, after writing to his Marist superiors in France in July 1899, to alter the plans and reduce the length of the nave to 55ft. with the western wall as a temporary end, to allow for future expansion. Father Joly, the Provincial, had written to Father Denier in France on 13th December 1891 requesting the purchase of a temporary wooden altar to be made in France. The next stage of the building was overseen by Sheerin and Hennessy, Architects, the second foundation stone being laid by Cardinal Patrick Moran in December 1899. The nave is much shorter than the usual church length and this gives a much more intimate experience. It resulted in the shape of a Maltese Cross rather than a Latin Cross as is the Church of the Holy Name of Mary at Villa Maria. The wall height of 25 ft. and the high roof, give very good acoustics for choral singers. The acoustics have been affected by the exposure of the floor boards with the removal of the carpet beneath the seats. The builders of the second stage were Dakin and Park of Gladesville at a cost of £2600. The walls are in dressed stonework except for the western end which consists of plastered brickwork. Special efforts were made to ventilate the church. Beneath each window on the external walls, is a cast iron ventilator leading within the wall to an internal ventilator on the splay beneath the window. In the ceiling are a series of triangular ventilators with similar shaped protrusions above, in the slate roof. The completed church was blessed and opened on 2nd June 1901. By 1899, a timber school building had been erected on the site and was free of debt due to fund-raising by the Parish Priest. Until 1907, the school was staffed by the Sisters of St. Joseph who walked from Mary Street each day. In 1908, the Marist Sisters of Woolwich took over the school, which burnt down in 1916. It was replaced by a brick building at a cost of £636, with tw0 classrooms, a stage, teachers’ rooms and a 12ft wide verandah. It was opened in November 1916 by Archbishop Kelly. There were 42 pupils at the time. The children of the Gallagher, Murphy, Bell and Doran families, among others, attended the school which closed in 1936. The 60 pupils transferred to Marist Convent and Marist Brothers. Later the Catholic Youth Organisation used the building for meetings, dances, and dramatic productions under the direction of the Misses Clark. A tennis court had been built on the site of the present gravel parking area and this was used by the members of the C.Y.O. The school building was burnt down in May 1968. In the early 1970s, the sanctuary was changed so that the priest faced the congregation and a modern altar and lectern were installed. The tessellated tiled floor was covered with carpet and the altar rails and raised choir platform, at the back of the church, were removed at this time. A new Rogers electronic organ (Model Essex 645i) replaced the old Hammond organ in 1989 at a cost of about $20,000. By 2011 this organ which had served us well was in need of replacement, so in November 2011 a new Allens Digital Organ was purchased and installed and now enriches our liturgies beautifully. In 1988 a major reconstruction of the Sanctuary area was undertaken. The main altar was resited and rebuilt, a new lectern was added and a new presidential chair acquired. The church was closed for this work to be done, from July until 4th December, 1988. New gates were installed and a red bitumen roadway was constructed leading to a red-gravelled parking area on the north side of the church. It was installed by Emoleum (Australia) Ltd. in March 1996 at a cost of about $20,000. Extensive landscaping was also done at this time. In 2001 the porch was altered and upgraded to provide disabled access on the southern side. A new door, terrace and steps were built on the northern side, making a very appropriate place for wedding photos etc.On Sunday 5th December 1999, a Mass of Celebration was held to mark the 100th anniversary of the laying of the Foundation Stone of the church which took place on 3rd December 1899. The celebrant was Fr. Tony Corcoran S.M., P.P. The music was provided by St. Peter Chanel’s choir with assistance from Villa Maria choir. The organist was Gai Woodcock. Morning tea in the grounds followed the ceremony.